I can hear you thinking, "What on earth is this? Rough crystals, boxed specimen, fossil shell, topaz crystal, handmade glass bead, Roman glass, pearls... are you crazy?" The orange kyanite made me do it! Judy Hall says it "looks like crystallized sunshine and fizzes with energy." 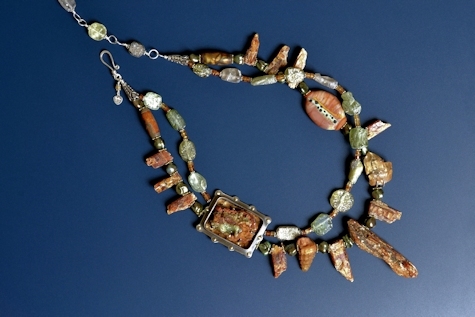 Orange kyanite was found in 2005 in Loliando, Tanzania with the first gem-quality material showing up in Tucson in 2010. The initial discovery consisted of soft material that disappointingly turned to powder. Then harder material and finally gemmy crystals turned up. Wiki says the orange color is due to inclusion of small amounts of manganese (Mn3+). These stones show the ragged edges that resulted from their contacting the surrounding schist as they grew. Kyanite is a very odd mineral in that it is assigned two different hardnesses. It is harder on one perpendicular axis than the other so gets 2 numbers. All kyanite demands a reasonable care in handling as does the adamite. The kyanites are thick and seem quite sturdy, the adamite can be brittle so I enclosed it in a sterling box to protect it and cushioned it with tanned tilapia skin. What on earth is adamite? "It looks suspiciously like the Smithsonite you just wrote about," you say? Good point. Dr. Pough notes that you can distinguish it from Smithsonite "by the lack of carbon dioxide bubbles on solution in hydrochloric acid." And no, I don't dissolve pretty crystals to find out what they're made of, I rely on the vendor for that. 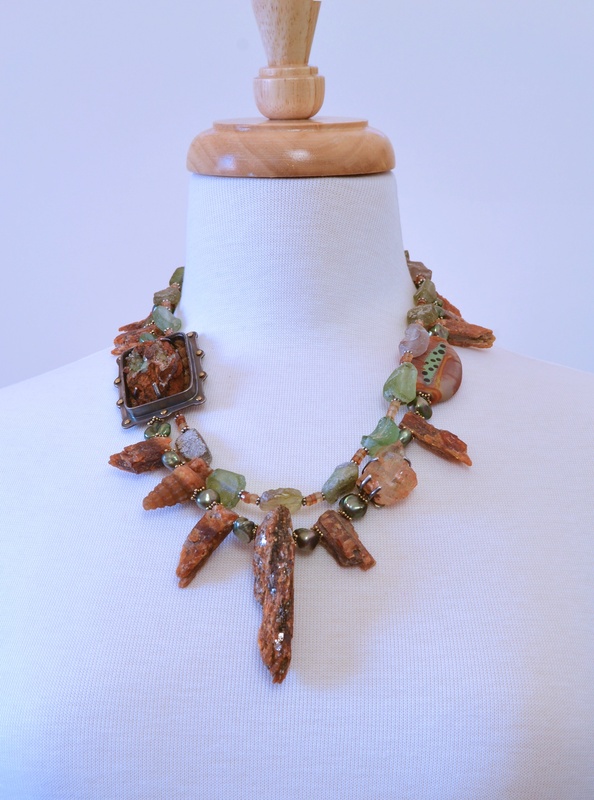 Unlike the orange kyanite, adamite is mentioned in our standard metaphysical texts. Melody says it can inspire avant-garde thinking, Simmons mentions taking on whatever challenges must be faced. Ahsian mentions it can help in creative problem solving... so do you think it helped me design this necklace or that I failed it somehow? Maybe it encouraged me to add the little topaz, "stone of true love and success in all endeavors" Melody claims. Which leads us to the issue of how a crystal with one termination should be oriented. For some reason the idea that the point should be up to draw the stone's energy down to the wearer makes sense to me. (Point down is said to release energy, e.g., negative accretions.) Others have different views, such as point up directs energy to upper chakras, point down has a grounding effect. 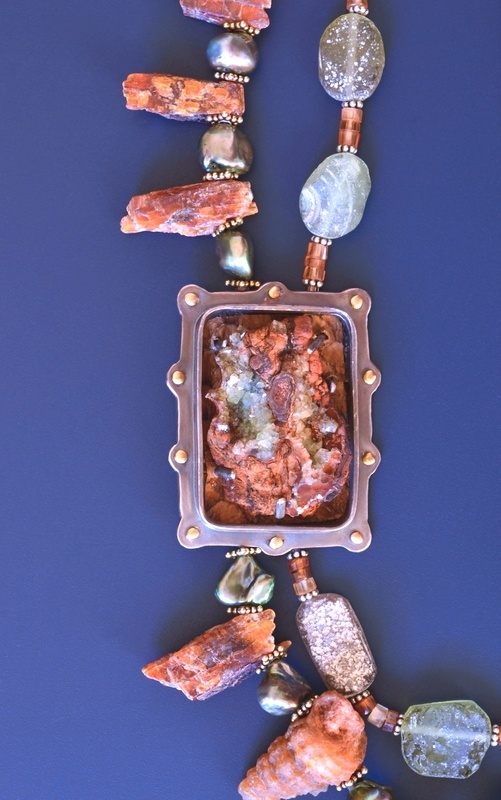 I made this piece the way I thought it wanted to be made, and curiously wound up with the little topaz over the heart where I subsequently found that many think a crystal should be worn. 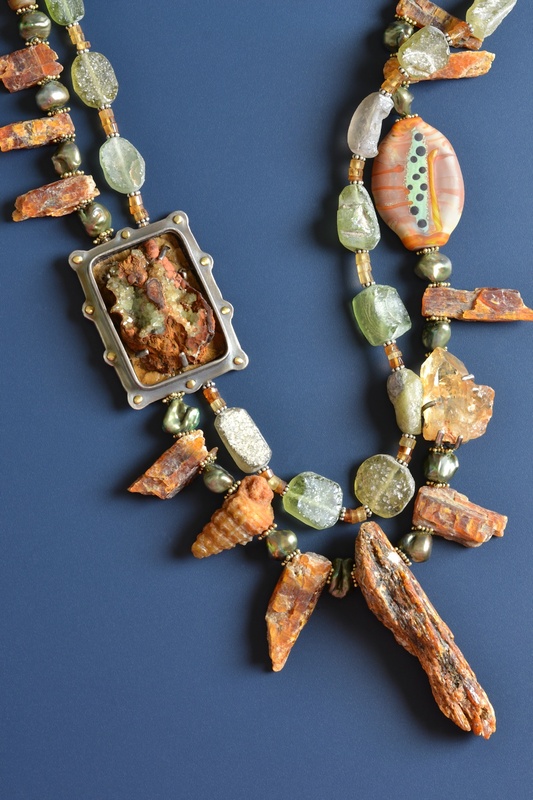 You may be wondering if the beads really are from Roman glass. I questioned it because it doesn't show the iridescence of some of the material found in Israel. Let's start with the wiki article on Roman glass which gives no indication that the iridescence was deliberately applied as it can be today. This implies that where it occurs it must be the result of weathering. 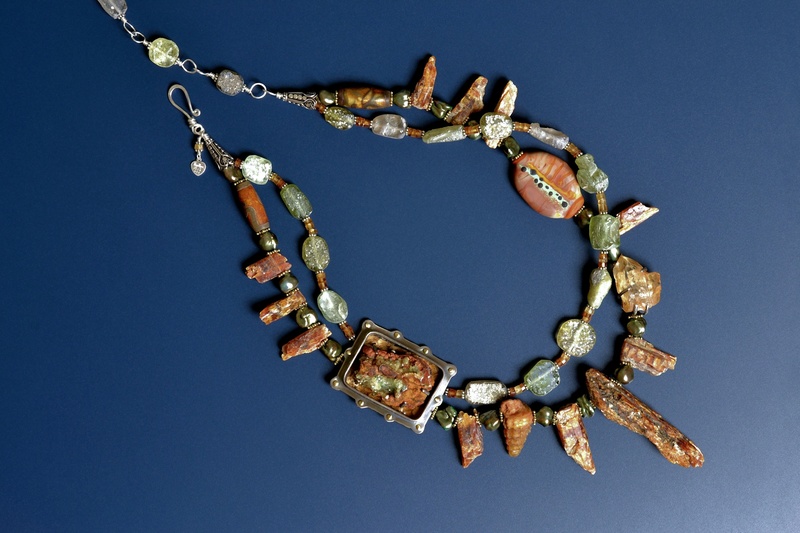 The documentation for the beads says, "This ancient Roman glass was found in the Nimroz province of Afghanistan. The beads are between 900 & 1200 years old, and were excavated in 2006. Glass has not been produced in this area for 900 years.” Aha! The Israeli glass is thought to be a lot older (~2,000 years) so theoretically would have more time for the iridescent patinas to develop. One vendor notes poetically that the "processes of nature have bestowed their rainbow shades" on the Israeli glass. There could also be significant differences in the mineral composition of the soils which would affect patinas. So this research convinced me that Roman glass is being excavated in Afghanistan, it necessarily appears different from Israeli deposits because it is significantly newer, and these beads are probably as advertized. For all my design work I first of all have a vision of what the piece should look like. However, I depend upon listening to the materials which may disagree. Some things like each other, some things that ought to work stubbornly cross their arms, take on an angry look and refuse to take part. Stones want a particular side up and I have to deal with it. Beads, like Karen's beauty here, demand to be included, or not. Oh dear my studio can be a noisy place until I get it right and they all breathe a sigh of relief, but maybe you knew that. Please order this piece to enjoy the subtle conversation between the elements which are now happily in accord. The fabulous colors and rich texture will surely inspire human conversations as well.